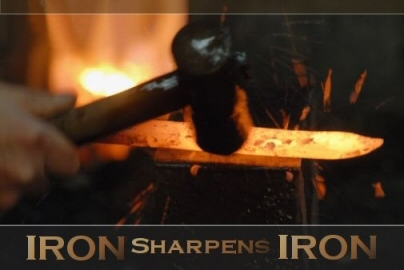 This is interesting to me because Solomon is saying that iron is sharpening iron. Usually a whetstone, which was an abrasive stone used in sharpening knives or other edged tools, was the instrument to use. I think the point that Solomon is making is two people, having the same nature, both iron, can sharpen each others mind, help each other to grow and be in tune to the things that are going on around them. And yes, they can even help each other to move in the right direction, to stay on track, to walk away from sin and towards God. And even if sparks do fly, if both sides are open to the truth, those sparks will not be deadly but will result in each instrument, each person becoming sharper in the Lord and their walk with Him.